Now that the holidays have come to a close, it is a wonderful time to “fluff and puff” areas of your home. Once all the decorations are put away, it feels like a clean slate to change things up! For this post, I am sharing a great way to create drama and great styling with mirrors and do it inexpensively. 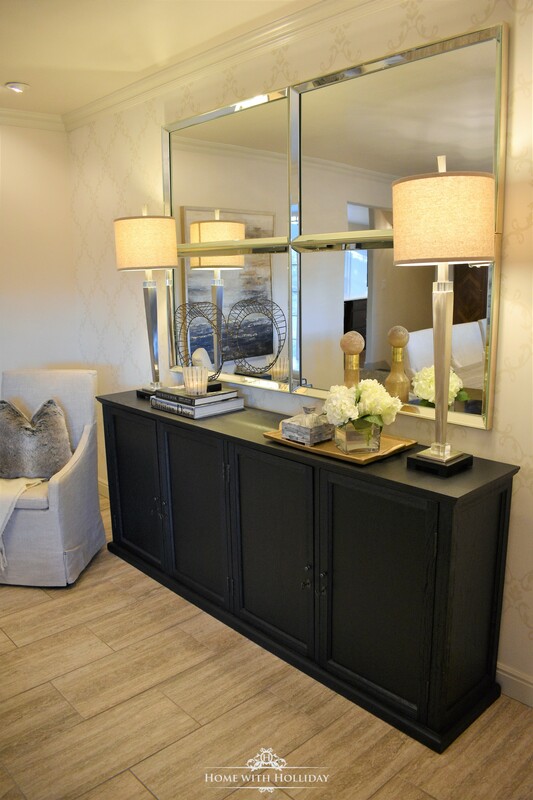 You could create this look over any buffet, sideboard, console, fireplace, over a bed, in a stairwell or other areas in your home that needs a lift or an update. After searching for larger mirrors, I decided to find smaller mirrors that could stack or be hung side by side. Plus, the larger mirrors were expensive and heavy. I actually stumbled onto these mirrors at Kirkland’s and they were on clearance for only $23.97 per mirror! JACKPOT!! I scooped them right up!! They were clean and simple and could easily be hung right next to each other so it would give the appearance of one large mirror. Making that phone call to my installer was interesting for sure! He was not thrilled when he got here to hang them when he saw what I was asking him to do. Clearly, though, he did a great job! Using a professional for this type of installation is highly recommended. Installing the mirrors like this provided the impact I was looking for without breaking the bank. After all, I regularly break the bank on my shoe and handbag obsession, so it is nice when a “hack” like this comes together!! Since I only spent $100 (plus the installation), I certainly wanted to share how easily this can be done. Smaller mirrors are usually significantly less expensive, more easily installed and can be used in multiple applications. Check out the photobomb by my precious Maltese, “Bella”!! You can see here the why a mirror or mirrors were essential to the full design of the room. First, the reflection they provide really accentuate my chandeliers in such a beautiful way. Secondly, they provide great scale for the girth of the buffet. Additionally, I can see all the way back to my fireplace in our living room, opening up the room so nicely. Except for the antiques in my room, all of the furnishings came from Restoration Hardware. Today, I am sharing these links to similar products that are less expensive but could still accomplish a similar look. Here are a few other inspirations for using mirrors similarly. The reflective qualities absolutely open up a room, making it feel larger and lighter. I love the antiquing of these mirrored tiles! This vertical application is great as well. This could easily be accomplished with inexpensive closet mirrors! Thank you so much for stopping by today! Styling with mirrors can create major impact, reflective drama and can be an inexpensive solution in small spaces or on large walls. Now that we are in a new year, I will be sharing more interior design and home decor ideas and inspirations. Please consider subscribing to my blog so you can receive instant notifications of my new posts! Happy New Year! Here's to a great 2018!! I’ve always loved using mirrors in my decor too! Thanks for all the beautiful examples and ideas! And thanks for joining our Friday Friends Parade! Thank you so much! I will do it again!